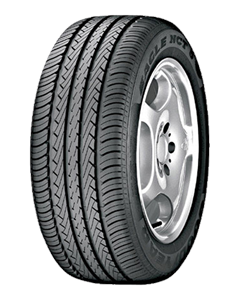 The Eagle NCT 5 is Goodyear's most environmentally friendly high performance tyre. It is produced using development and manufacturing techniques which optimise the use of energy and resources. Its silica based tread compound produces low rolling resistance, reducing fuel consumption by up to 5% versus its predecessor. Optimised shoulder to centreline stiffness equalises tyre stress and load distribution, giving improved handling and mileage as well as minimised noise levels.